For that big day, make a breathtaking grand entrance and/or exit in our elegant horse-drawn coaches. Take a moment to review our stunning horse and carriage options. Horse-drawn funeral procession ... an inspiring tribute for a loved one. Choose a distinctive open hearse or a gothic glass enclosed hearse. Both styles available in black or white. The secret to our success is paying attention to all the details when it comes to horse carriage services. You will appreciate our commitment to excellence and our extensive experience. Let us add a touch of enchantment to your next occasion. 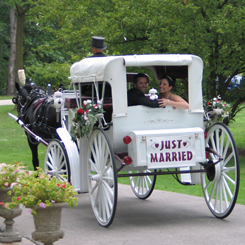 Jim & Becky's Horse & Carriage Service in Chicago, Illinois, provides exquisite horse and carriage services for memorable occasions. A horse and carriage experience will make your wedding, quinceanera, or any special event unforgettable. 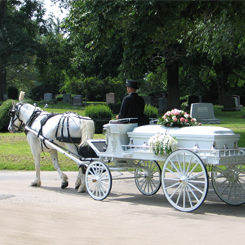 A funeral procession with a majestic horse drawn hears is a dignified and memorable way to honor loved ones. We're known as wedding specialists because we offer a pristine selection of exquisite coaches such as our beautiful Cinderella Carriage. Our carriage horses are stunning in appearance and performance. Our regally attired coachmen are professional and personable. Pricing varies with the type of carriage you request, your location and the amount of time needed. For more than thirty-five years Jim and Becky have been recognized as Chicagoland's leading horse and carriage professionals. We are known for our top-notch performances at weddings and other significant social events. Serving the greater Chicagoland area since 1980. 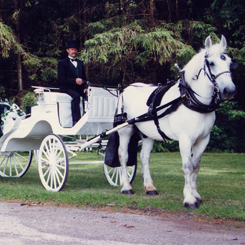 Thank you for your interest in our Chicago area horse and carriage service with white wedding carriages, Cinderella Pumpkin Carriage, funeral carriage. weddings and funeral carriages. For questions, pricing and availability, please use the inquiry form listed here. Include the date and location of your event. Or feel free to just give us a call. We look forward to hearing from you soon. We prefer to keep the trucking of our horses and carriages within a 60 miles radius of our Peotone location, however under special circumstances we have traveled further.